Last week’s episode on the qualities and habits of the world’s best coaches was the most popular episode we’ve had in a few months. If you missed it, I’d suggest that you go back and listen because there’s some great food for thought there. We can all incorporate these qualities into our coaching and become much more effective and successful coaches. On the podcast I share my suggestions to Dennis about how he can develop a defensive attitude within his team. TeamSnap is the sponsor of this week’s episode. One of my favorite hidden benefits of using TeamSnap is the ability you have to track every aspect of your team’s season in one place. You can look at the lists of locations your team has played, the opponents they competed against, the results from those game and even see the pictures that parents have uploaded from those events. All of this can be really useful if you need any of this information to return to a field you haven’t been to in a while, contact a team to attend your tournament or set up a friendly or list your team’s record when applying to attend a tournament. Whether you coach or manage a single team or organize a whole club, league TeamSnap makes organizing every aspect of active sports life easier. 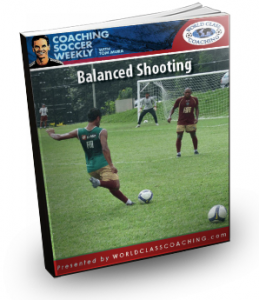 This week I share a shooting training session that I decided to do after seeing my players struggle with their balance while shooting and passing in our games last weekend. I’ve shared a couple of shooting sessions in the past. In episode 23 I discussed a progressive shooting session. Just about a year ago I released episode 43 Great Shooting Activities for the Winter Months. This episode includes different activities that focus specifically on the importance of balance in the shooting action. Check the show notes below for the complete diagrams and descriptions in this session. They are FREE but you will need at least a Free Membership to the Training Center in order to view and print them. They’ll be available there for eight weeks before they’re placed in our archive which can be accessed at any time by Pro and Elite Members. After last week’s episode on the qualities and habits of great coaches I was emailed buy a coach who just finished a Masters Degree in Sports Coaching and he had some interesting things to say about the Player / Coach relationship. We’ve set up a time to talk so hopefully I’ll have that discussion for you on next week’s podcast. The show Notes aren’t available even though i have a free Membership!! I’ve corrected that issue for you. You should be able to access the show notes now. Hi Tom, thanks for this. I ran the session tonight with my U8s instead of a shooting practice we have done before. It worked very well, although we had to progress it a little faster than I would have liked due to shorter than ideal attention spans on the technical aspects. We’ll come back to it again to tweak their body positions. Hi Will, it’s great to hear that it worked well for you. Try turning it into a contest next time. “Let’s see who has the best balance!” That will make it more like a game rather than work.